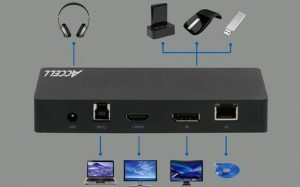 Accell USB 3.0 Full Function Docking Station | Nerd Much? My latest PC build left me with 12 USB slots. Now, to the average PC user, that might seem like way more than they need. But for someone like myself, who has gadgets on gadgets on gadgets, those 12 slots filled up quickly. Headsets, mouse, keyboard, earbuds charger, Fitbit, Xbox One controller, Bluetooth adapter, etc, etc, etc. Of course, we all already know about USB hubs, which are used to turn one USB port into three or four USB ports, but what happens when you add other useful ports to it? For example, what if you wanted another HDMI port or DisplayPort? Introducing the Accell USB 3.0 Full Function Docking Station, which extends a solo USB port to three USB-A 3.0 ports and a USB-B 3.0 port, adds a high-def DisplayPort (3840×2160), an HDMI port (2560×1440), a headphone jack, and a Gigabit Ethernet (RJ45) port. Not only can you plug in more USB 3.0 devices, but you’re also able to add two more monitors to your setup with ease, thanks to its DisplayLink USB video processing technology. If you’re wondering how to add an HDMI port to your PC without getting a new graphics card, here’s your answer. So if your workstation is starting to feel the strain of the USB revolution that is upon us, check out the Accell USB 3.0 Full Function Docking Station to expand. Buy the Accell Docking Station here. For more cool nerdy stuff, stay tuned to Nerd Much? for daily finds. You can also check out our roundup of the best nerdy gifts for this holiday season.